WAVES Trust invites our network to attend the opening of the Behind Closed Doors exhibition. Behind Closed Doors is an exhibition which uses doors as a canvas to profile the issue of family violence in Waitakere. The doors have been transformed by various local groups and organisations, with the exhibition aiming to bring family violence out into the open in order for our community to confront this important issue. 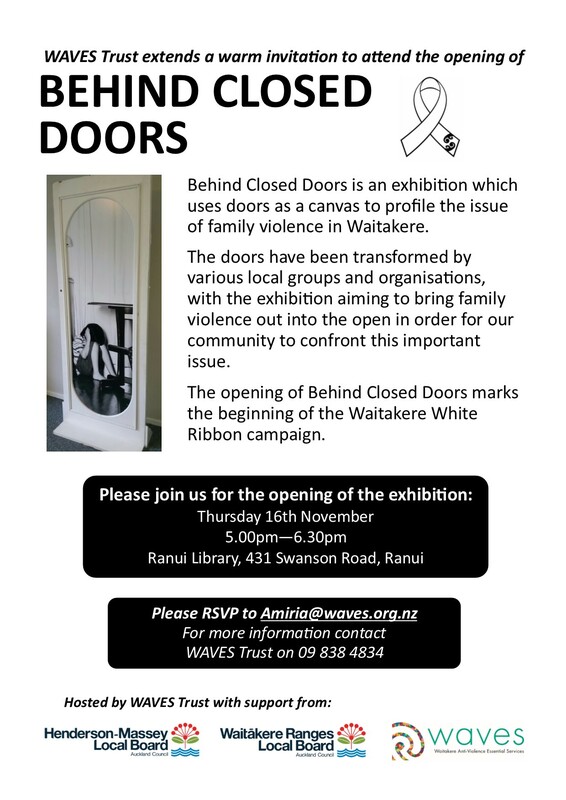 The opening of Behind Closed Doors marks the beginning of the Waitakere White Ribbon campaign, with events taking place across Waitakere throughout the week of White Ribbon (Monday 20th November – Saturday 25th November). With the opening of this year’s exhibition we would particularly like to acknowledge the contribution of Te Kura Kaupapa Māori o Te Kotuku. Te Kotuku is a full-immersion Māori school in Ranui that has embraced the kaupapa of Behind Closed Doors and adapted it to make it relevant for their school community. Te Kotuku have produced 6 doors for this year’s exhibition, and with this opening we would like to acknowledge the kura’s special contribution to Behind Closed Doors and the wider Waitakere White Ribbon campaign.WAVES Trust invites our network to attend the opening of the Behind Closed Doors exhibition. Details about the event can be found on the flyer below.